We are excited to surprise our girls when visiting the Lenkerhof. It is not really the gourmet restaurant Spettacolo for them offering a choice of 16 different courses, which change every day or the renewed and ancient old thermal spa waters they are after. No, the thing that gets them really excited is the fact that the pool boasts its very own indoor slide! The Lenkerhof is steeped in history. It began 350 years ago as a Spa hotel with its own Sulphur spring. Today, it mainly caters to Swiss guest in search for the Alpine tranquility, nevertheless all nationalities are more than welcome. As in most Swiss hotels the staff at the Lenkerhof is extremely accommodating. For instance, there is always someone around to answer your questions and, in the morning, free water bottles are handed out at the entrance. If you are not as lucky as us to experience days filled with sun they are equally happy provide you with an umbrella. Overall, we are in awe of the beauty and comfort of this hotel. Not to mention its own little pamphlet about pillow choices! Our connected rooms are very comfortable and equipped with all the amenities you might ever need. We share a nice balcony which overlooks the valley and the mountains in the distance. The refreshing mountain air fills our lungs and we feel totally invigorated. Although for families we recommend the connecting rooms you might also opt for one of the suites. For example, the Suite Mediterrain. Designed in Mediterranean style, this light and friendly suite Mediterranean, more than 80 m² in size, caters for all tastes. The fireplace and the Nespresso machine in the living area provide a cosy atmosphere to enjoy fine delights, while the comfortable double box-spring bed is the ideal place to rest and relax. For children, there is the possibility to turn the couch into a sofa bed and to have a baby cot put up. We are pretty sure the our youngest would love to do that. We always love a personal touch in a hotel. Especially if this touch is connected to the owner or manager of some other member of the staff. In the Lenkerhof there is a permanent exhibition of works by Jürg Opprecht (proprietor of the Lenkerhof) and alternating works both by well-known and lesser known Swiss artists. Inspired by al the works we make an impromptu art walk through the building, again and again discovering new delightful objects. It feels a bit like visiting an art museum without leaving your hotel. There are more reasons why you might choice to not leave the hotel. For example, the 7 sources beauty & spa wellness area, named after the seven sources of the River Simme. It is one of Switzerland’s most extensive wellness landscapes covering 2,000 square meters. The spa menu even offers special kids beauty treatments. Furthermore, the hotel offers a 34°C outdoor pool with its healing Sulphur water. The pool is lined by sunbeds and offers a panoramic view of the mountains. Bathing in this water is very good for the skin and helps to alleviate skin conditions, rheumatism and joint pain. The sulphur is quite intense so you are not supposed to stay in the water for too long by the way. Just adjoined to the outdoor pool, through an airlock you enter the indoor pool with slightly less warm water perfectly equipped for making some laps. The sulphur is quite intense so you are not supposed to stay in the water for too long by the way. No problem for the girls, since opposite the indoor basin finally they discover the Wet’n’Wild water slide. What an exiting experience to have this attraction completely for kids only for hours. After 18:00 hours both pools are exclusively reserved for adults, so make sure you’ll be there on time. With all these experiences in the hotel, you might forget that the Lenk region has many, many things to offer in terms of family fun. First, the hotel is near a cable car (no you cannot hear it) which is great for people who do not want to walk far. The mountain cable cars in Lenk are inclusive upon one night in a hotel. All the guests with this card also enjoy free travel on all Lenk bus routes. As you might guess the Lenkerhof is based in the lovely town of Lenk which is first mentioned in 1370. The oldest traces of a settlement in the area come from Neolithic artifacts that have been found scattered around the municipality. The way into the Simmental gives a breathtaking first view of the three peaks of the Wildstrubel. The opulent massif guards the valley, forming both the natural end to the valley and the border with Valais. Long before the first spa visitors came to the Simmental, the Stone Age hunters had gathered there. Neighbours from Valais sought their fortune here too. The thermal water in Weissenburg became popular in 1604. From 1686, high society started staying in Lenk for curative treatments. Around 1900, there were 250 guest beds, mainly for summer tourism. Soon the first winter sports guests arrived. And in this time and age you can experience almost every winter sport that has ever been invented. For this we have to go back sometime in winter as for now we enjoy sunny days with 30°C. Fortunately the choice of summer activities is no less impressive. One of the big attractions are the numerous hiking trails. Though a fun activity for the somewhat older children, in many cases a long walk is just to boring for the little ones. Well, this rule does not apply to the trails on offer in this region. For example, we walked the Marmot rail; a journey of discovery into the world of the marmot. The walk isn't very strenuous but is a fun, eventful trail for all ages. The path takes you from Leiterli mountain station to Stoss central station. Our girls explore the marmot habitat through easily accessible holes and they test their agility on the wobbly bridge and find out how many "marmots" they weigh with the marmot scales. Furthermore, you will be quizzed on your knowledge of animal sounds and tracks? The next few stations will help you improve this knowledge. At the end, the path will take you to the maze with a barbecue area, where there is another chance to practice climbing and balancing. All in all, is a truly heart-warming experience that brought us a couple of hours of great family fun. If you look for a little more climbing, you might consider the cave walk. This hike will lead you past three caves: Zwärgliloch, Schnurenloch and Mamilchloch. The oldest stone tools in the canton of Berne to be made by human hands were once discovered here. With plenty of scrambling and ladder climbing, this route is perfect for cavers. The first cave mentioned is easily accessible. If you like to venture to the second and third be sure to bring waterproof clothing, a torch and hiking boots. The circular track takes you over a mountain path, through a natural tunnel and up a ladder into Schnurenloch. To get to Mamilchloch (rock milk), you will need to use the freestanding ladder, which is 10 meters long. Enough excitement for a day? Another hiking trail we highly recommend is the 4 km Lynx trail along which children learn how wild cats live and behave. The walk begins at Leiterli mountain station. A relatively good, gently sloping natural path will take you by the well-known Hasler Hochmoor. Along the way you will discover various interesting facts about the lynx and its habitat. Follow the lynx or fox tracks. The trail you will find life size figures of the lynx, as well as its prey, such as roe deer and chamois. Because the lynx is a shy and very cautious animal, you may not actually see any on the Lynx Trail, but that does not diminish the overall experience at all. If you go up the mountain by cable car but for some reason do not feel like hiking down, a thrilling option, especially for teens, is to go down by mountain carts. These vehicles are fitted with a comfortable seat, wide tires and good brakes. This means there's nothing standing in the way of safe cruising fun! The Mountain Carts can be hired from Metschstand mountain station and returned at Metsch central station. 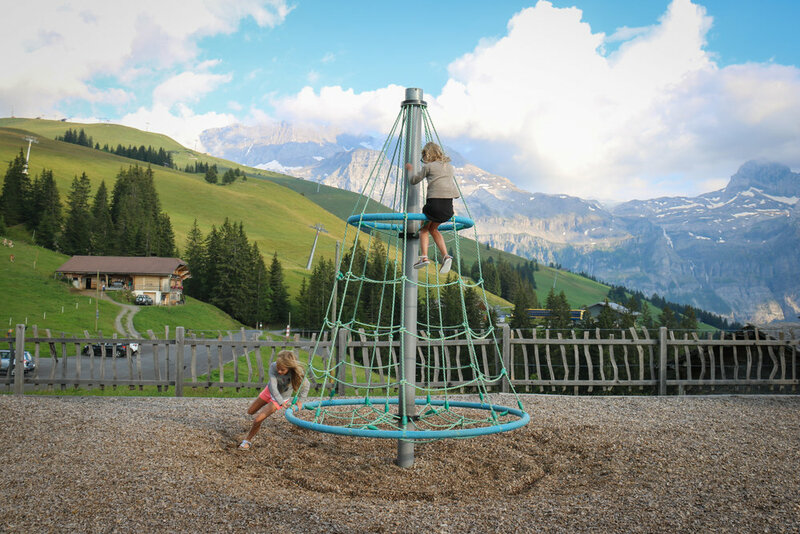 For maybe an even greater adrenaline boast, you can climb in the high rope park in Zweisimmen. The majestic trees of the Obersimmental make fine pillars for wobbly cable bridges, tricky and varied bridge elements, amusing rope ladders, crazy Tyrolean zip-wires, daring leaps and high-speed downhill runs. At heights of between four and twenty meters (thirteen to sixty-five feet) above the ground, you will surely encounter and hopefully overcome, some personal barriers. After all these activities your appetite will probably go through the roof, lucky you, as the Lenkerhof is a culinary heaven. With children you really shouldn’t forget to eat at the Bühlberg restaurant, a stylish and yet orginal easy-going restaurant. It’s terrace is situated at 1,664 meters, so a great stop during a hike or bike-tour and in winter during skiing. The best part for us is the huge playground directly in front of it. It offers a large car park but the roads are tiny so consider taking the regular bus shuttle to get there. The view of the Wildstrubel, Wildhorn and the Plaine Morte Mountains is really breathtaking. Down in the valley at the Lenkerhof itself, we already mentioned the gourmet restaurant Spettacolo. Well we can be rather short about this remarkable experience. The food that came out to our table was amazing, every dish was incredible. So tasteful and the presentation was like an art form. The dishes are size-wise as in Michelin star restaurants and the setting is going in that direction too. The Restaurant Oh de vie with its lovely interior design, is an Italian à la carte menu, perfect for a lovely and romantic night for two. Dining together as parents with some little ones in tow? Not at the Lenkerhof, the hotel has its own kids restaurant, the Little Prince. The little princes and princesses are bound to satisfy their appetites here with schnitzel, burgers, salads and more. And if they’ve finalised their meals, they can enjoy themselves in the ‘Alpine PlayStation’. A hidden den in the basement of the restaurant filled with toys and art materials guided by a very enthusiastic staff member. The alternative translation of PlayStation as kids will not find the digital equivalent. The philosophy here is to really reconnect with their true creative talents. # Both the Marmot, Lynx and other family hiking trails combine playful elements and art. Game stations made from wood capture the children's imagination during the walk. They are highly recommended for a day of outdoor family fun. # We really like the idea of the ‘non-tech’ Alpine PlayStation. Kind staff is around to encourage kids to make their own art works with wool, wood and rope. It’s always good to have them disconnected from their mobile devices. # Our experience with Lenkerhof was just amazing, from the front desk to room accommodations to superb culinary dining. Everything about the resort was top notch with still a kind of genuine hospitality.